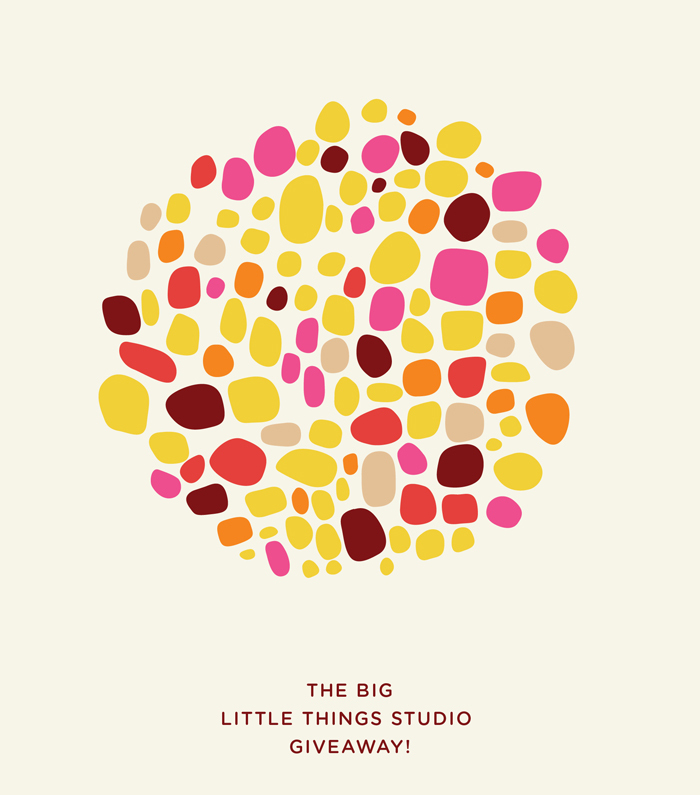 For the first Little Things Studio giveaway, I’m going to pick FIVE random winners. 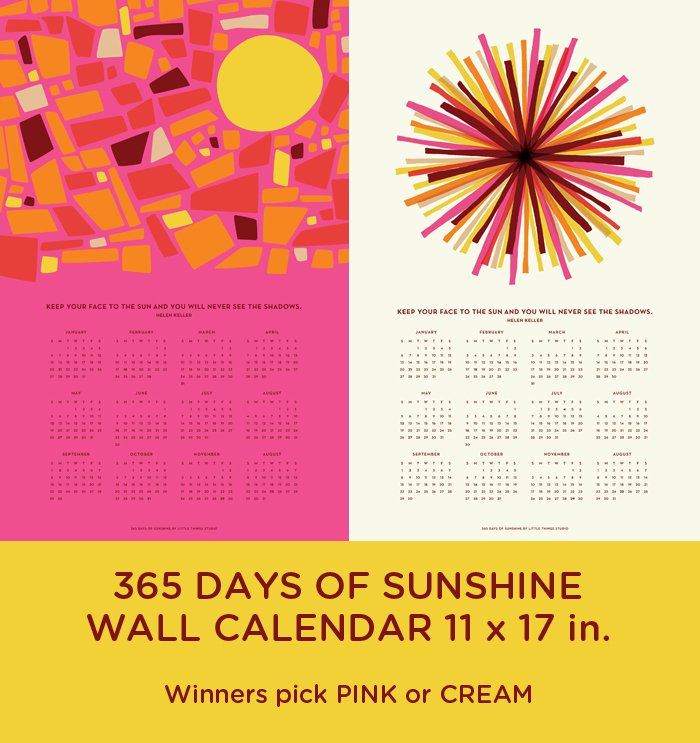 They win one of the brand spanking new 2013 YEAR OF SUNSHINE wall calendars (pink or cream – see below) AND a small print of their choice!!! To enter, please comment below and tell me your favorite Christmas carol (I’m working on Christmas cards and need inspiration). Enter the email address you’d like me to contact you with IF you win! Contest ends on Saturday, October 20 at noon (central time). You must be a facebook fan. I am going to double check to make sure you are a fan!!! If you aren’t, I will randomly draw again a new name. You cannot enter more than once. If you comment again, it be counted as invalid. If you are the winner, I will send you an email on Saturday afternoon to get your mailing address and to wall calendar and small print you picked. I’m excited to see how this giveaway goes! I am making sure this is as fair to everyone as possible. I’m going to use some kind of random number generator that Dave is going to find for me somewhere on the internet! If this goes smoothly, I might want to do this every year. And I will be putting up the new wall calendars next week! I promise! Nearly all Christmas music makes me want to vomit, but I’ve always had a soft spot for Paul McCartney’s “Wonderful Christmas Time” and John Lennon’s “Happy Christmas.” I also don’t *completely* hate when “I Wish It Was Christmas Today” (from an old SNL sketch) gets stuck in my head. P.S. I never realized who sung either of those songs & I find it exceedingly coincidental that they’re both Beatles. Thanks for that! Bruce Springsteen’s “Santa Clause is Comin’ to Town” is my all time favorite. Love the Big Man on the saxophone! “The First Noel” of course!! Every Christmas, my family buys anything and everything that says “Noel.” All wrapping paper, decorations, and yes, holiday cards must say “Noel”!! Love this giveaway! And you know I’m a fan of everything you do! 🙂 My favorite Christmas songS are (sorry can’t choose one) “Let There Be Peace On Earth” by Vince Gill, “You Make it Feel Like Christmas” and “Morning Has Broken” by Neil Diamond. And thanks to Ally Watkins I now have a new favorite after googling the “Wexford Carol”! I love, love, love your work! My favorite Christmas carol is probably Breath of Heaven by Amy Grant. It’s so haunting and powerful and beautiful. We Three Kings ( you could do something with the “Star of wonder” line?). And “Baby it’s Cold Outside” (though not technically a carol). O come, O come, Emmanuel gives me goosebumps every year. Love your color scheme this year! my best carol memories are singing The 12 days of christmas with my mom. she was always helping me remember the parts I forgot. On a sidebar, please do something related to Tie A yellow ribbon on the old oak tree. Please???? 😉 you are amazing, as always. Mmmmm love iiiiit. Welp, I think I love Have Yourself A Merry Little Christmas or Little Drummer Boy the most. I freakin miss you Kate. Can’t wait til you come! O Holy Night is my absolute favorite… reading any of the words brings the song to mind so quickly. Love your calendars! Just discovered you on fb and really think your work/studio is swell. I hope to do something similar in the future with my designs. O Holy Night. I love your designs, Kate!! Some of my many favorite Christmas carols are Silent Night, White Christmas, and The Christmas Song (Chestnuts roasting on an open fire). And I love you! Oh my goodness! I just found out about this…and in the knick of time! I love Silent Night. We sing it at our church and I get goosebumps every time. I am SOOOOO excited to see you at the Renegade Craft Fair in December. Have a wonderful day! I will always love Vincent Guraldi’s “A Charlie Brown Christmas.” It’s not really Christmas until I hear it! One of my all-time favorite X-mas carols/songs is “Come Thou Fount of Every Blessing” as sung by Sufjan Stevens. Cheers! Favorite carol is “the Christmas song” can’t wait to see what you come up with! I love all Christmas Carols and most Christmas music. Go Tell It On The Mountain that Jesus Christ is Born…..and Mary Did You Know are two of my favorites that I haven’t seen already mentioned. Christmas music…..my favorite !!!! and Angels we have Heard on High brings tears. Night is a carol. See?? My favorite is “O Little Town of Bethlehem”. Words are so beautiful. “No ear may hear His coming. Yet in this world of sin, where meek souls will receive Him still, our dear Christ enters in”.